1. Mix 1½ cups of flour in 1½ cups of water (retain the balance flour and water) and keep aside for 30 minutes. 2. Add instant yeast and jaggery to the ¼ cup of remaining warm water and mix well. Allow to proof for 10 minutes. 3. Add yeast mixture to the wheat flour mix. Add salt and ghee. 4. Start kneading adding the remaining flour little by little. I used one cup and half cup remained. If your dough is sticky, you can use wooden spoon to mix well before flouring your hands and kneading it. 5. Knead for 15 minutes and then allow to rise for about 1.5 hours. Once doubled in size, gently deflate and knead lightly for a few seconds only. If the dough is sticky, you may need to lightly flour your hands when handling or shaping the dough. 6. Shape into a loaf and transfer to a loaf pan and leave to rise for 45 mins. 7. Pre-heat oven to 220°C. Bake for 12 minutes, then cover the bread with aluminium foil as the top browns very fast. Bake for remaining 25-30 minutes or till done. 8. Remove from oven, cool in the pan for 10 minutes. De-mould and allow the bread to cool fully and then slice. 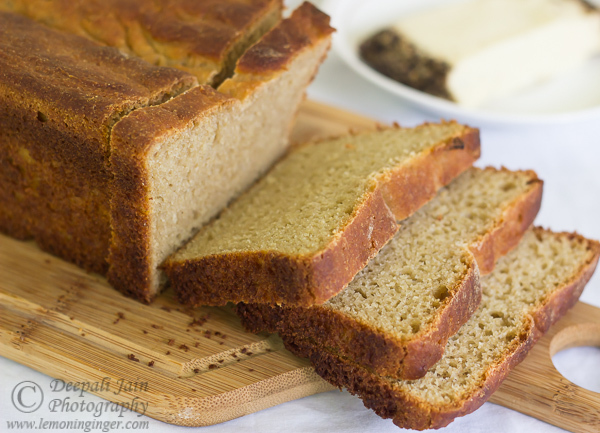 A delicious bread made with whole wheat flour, jaggery and ghee (clarified butter). Say NO to refined flour, sugar and even oil/ butter.